A collapsed building is seen after a massive fire broke out Sunday during a fireworks display at the Puttingal temple complex in Paravoor, India. THIRUVANANTHAPURAM, India -- The Hindu temple in southern India was packed with thousands of people for a religious festival early Sunday when the fireworks began -- an unauthorized pyrotechnic display that went horribly wrong. 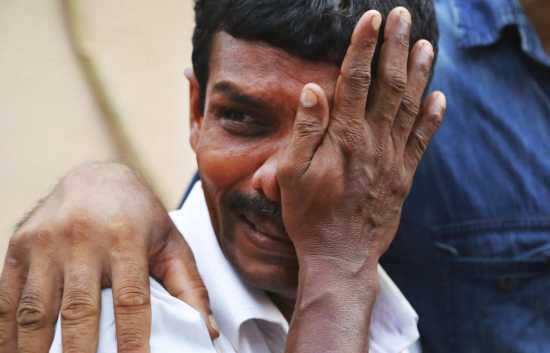 Explosions and a massive fire swept rapidly through the Puttingal temple complex about 3 a.m. in the village of Paravoor, killing 102 people and injuring 380 others, officials said. Scores of devotees ran in panic as the massive initial blast cut off power in the complex. Other explosions sent flames and debris raining down, a witness said. Many people were trapped inside. "It was complete chaos," said Krishna Das of Paravoor. "People were screaming in the dark. Ambulance sirens went off, and in the darkness, no one knew how to find their way out of the complex." Das said the first deafening explosion occurred as the fireworks display was about to end and as he was walking away. It was followed by a series of blasts, he added. An unidentified man weeps as bodies of victims lie outside a morgue at the district hospital Sunday. The fire began when a spark from the fireworks show ignited a separate batch of fireworks that was being stored in the temple complex, said Chief Minister Oommen Chandy, the top elected official in Kerala state. Most of the 102 deaths occurred when the building where the fireworks were stored collapsed, Chandy said. About 60 bodies had been identified so far, he added. Das said six ambulances had been parked outside the complex as a precaution. They carried the injured to hospitals in the state capital of Thiruvananthapuram, about 37 miles south of Paravoor, as well as the city of Kollam. Villagers and police pulled many of the injured from under slabs of concrete. TV channels showed video of huge clouds of white smoke billowing from the temple as fireworks still were going off in the sky. One of the explosions sent huge chunks of concrete flying as far as half a mile, said Jayashree Harikrishnan, another resident. Firefighters brought the blaze under control by about 7 a.m., officials said. Rescuers searched the wreckage for survivors, while backhoes cleared debris, and ambulances drove away the injured. Thousands of worried relatives went to the temple to search for loved ones. Many wept and pressed police officials and rescue workers for information. At one of the main hospitals in Thiruvananthapuram, Dr. Thomas Mathew said that judging from injuries, a stampede was also likely to have occurred. The temple holds a competitive fireworks show every year, with different groups putting on displays for thousands gathered for the end of a seven-day festival honoring the goddess Bhadrakali, a southern Indian incarnation of the Hindu goddess Kali. 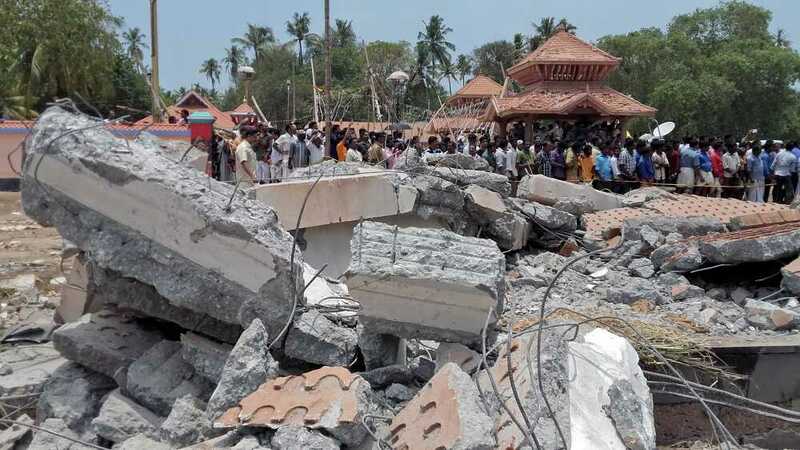 This year, however, authorities in Kollam district had denied temple officials permission to hold the fireworks display, said A. Shainamol, the district's top official. "They were clearly told that no permission would be given for any kind of fireworks," Shainamol told reporters. Permission was denied over fears the competing sides would try to outdo each other with more and more fireworks and because the temple gets overcrowded during the festival, she said. Public displays of fireworks can be conducted only with permission from district officials, Shainamol said. Chandy, the state's chief minister, said he had appointed a retired judge to investigate the events leading to the fire and that strict action would be taken against those who had ignored rules. "We will be investigating how the orders were flouted and who was responsible for the decision to go ahead with the firework display," Chandy said. Prime Minister Narendra Modi flew in from New Delhi to visit the site and met with Chandy and other Kerala leaders on measures to help the survivors. Modi was accompanied by a team of doctors and burn specialists from New Delhi who will stay on to help treat the injured, officials said.